The other day GameInformer revealed the two covers being used for their April issue. To be honest, when I saw the two images it occurred to me that 2011 is stacked with titles that honestly make me glad that I play video games. In a year that is going to be filled to the brim with new gadgets, Triple A titles and returning favourites, is it crazy to say that my most anticipated game is the sequel to the sequel I bought on a whim almost two years ago because it came with a free bandanna? (Other than the unofficial official Saturday Morning Arcade Queen's title, mind you). Saint's Row: The Third is the third (duh) installment of THQ/Volition's over the top and gangster trope filled open world sandbox game. To many, the Saint's Row games, while occupying the same plane as the Grand Theft Auto series, exists on the opposite end of the spectrum. In a year where GTAIV delivered players a more serious and realistic tone, Saints Row 2 (SR2) stuck to a more wild and chaotic world - a decision many players actually preferred to the former. It's certainly not everyone's cup of bullets, but SR2 far exceeded my expectations from the genre. With that said, there's some stuff I want to see happen when the Third Street Saints hit the road again this Fall. Hit the jump for a summary of what GI revealed and my initial wishlist for the game. While fans of the series have terrorized the city of Stillwater for the past couple of years, Volition is promising players a new stomping ground for the Saints' third outing. According to a press release from THQ, this won't be your typical rags-to-riches journey usually in other open world crime games (yes, even the first two Saints Row did this). Instead, you and your gang are already at the top. Now a recognizable brand, the Saint's have attracted the attention of The Syndicate--a legendary crime fraternity looking for their cut of the action. For players of the first two games, obviously something like this doesn't fly with the Saints. And obviously, there are going to be a lot of dead bodies because of it. To me, the biggest thing to come out of the press release was that players will already start out at the top, which ultimately leads to "no delivering pizza, no shuttling family members about in a long series of taxi missions". For those unaware, in the original Saint's Row games, there was a respect system in place. In order to open the next set of story missions, players had to earn rep by completing various side missions such as pizzas, collecting prostitutes and even using a septic truck to ruin property. Many people had a problem with this system and it seems that Volition took that fact to heart. While I'm all for the reduction of the need to grind, I hope that such activities are included in some capacity. The second Saint's Row had some really fun and unique side missions that could really be improved upon by tweaking their engine. Being on top is nice, but I really hope your roots aren't forgotten. That's not to say you can't enjoy where you are. Being the head of not only a gang, but an entire brand can also introduce new activities for you to do. Whether this means designing your own clothes, getting rid of competition, chasing endorsements, or even promotional events - the fact that you're now in charge of a business means that you aren't just dealing with the sketchy stuff anymore. It would be cool if you had to manage your public image, even if it means resorting to less traditional means to do so (or would that be more traditional in terms of crime games?). 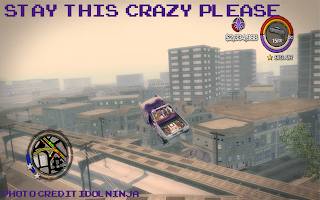 Regardless, while new and improved side missions can do wonders for the replayability, what I really wish for is that this new Saints Row keeps being Saints Row. Change can be good, but what made the first two games fun was that it didn't change the formula too much. It was still an open world game that threw everything at you and laughed while doing so. It didn't try to tell a meaningful story, but instead tried to make you smile. 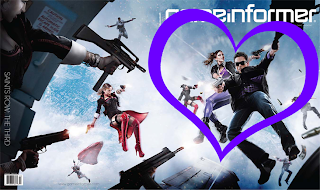 If Saint's Row The Third can keep that zaniness, that balls out insanity, and frankly, just keep us smiling and refine it, then I honestly believe we have a game of the year contender on our hands. Oh, and this. They need to keep doing stuff like this.